I am always looking for something new, something different to make. I love different. I found something like this on PINTEREST. One 8x10 frame, I left it the wooden dark brown. I took olive good knitting yarn and a blue color knitting yarn. Wrapped the sides in the green and the blue on the top and bottom. I had a wooden "J". I mixed up the color so that the "J" matched the blue color yarn. Attached to the frame and hung on the front door....I love it. I had been looking for the right wreath to hang there but I thought this was neat..different. For fun, I take pics with my cell of license plates that are different, have a meaning, have a message... etc. and I post then in my License Plate album on facebook. People love seeing different things like that and they really enjoy it. Over the weekend I went to Kentucky with my friend Theresa. We actually went for her families reunion. Her name is Montgomery and my maiden name is Montgomery. I went to school with a Montgomery but other than that, I have never ran across anymore. Theresa and I compared our family history but could not find a connection but she felt it would be fun if I went to the reunion with her.... I know both her sister's also so I thought it would be fun. We met with her sister, her husband and their son at the Bread of Life. This place was started by a couple that at one time lived in the Mennonite community of Russell County Ky. They started to adopt special needs children and found that was their calling. 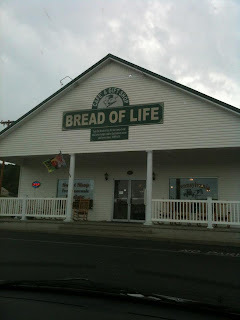 They started the Bread of Life to support themselves and the kids they raised. The other day I stopped in Goodwill during my lunch break. As I was walking around looking, I ran across this baby. Amber color, heavy, large and not a chip at all. I really did not need this but I figured that it would be nice to have on hand. Loved the work around the edge, thought it would look great with a ribbon weaved in it...and cookies, cake or cupcakes on the top....should look great. Just wanted to throw something out there to you, if you facebook, which I am sure most if not all of you do, there might be a facebook page for your community (city) that you live in. I stumbled across mine by accident. Ours is called HIP HERMITAGE. So with that I joined that page. It allows you to know what type of things that are going on in your area, like I was unaware that there was a "food truck" from farmers that would set up at a certain place to sell crops. Then I got to thinking, I live next to two other communities (cities) that I am in a lot, so I looked them up…yes, they had a HIP community also. But to my surprise there is also a trading post that includes two of those communities. On that side you can post yard sales, things you wish to sell, things you are looking to buy and even items you make….its really cool, so if you are a facebooker, check it out, your community might have a page also. I like most animals. Not afraid of many. But there is one animal that I have taken a total dislike to…. 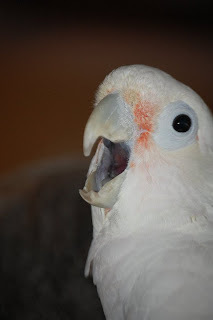 (sorry Ray)… That would be my brother's bird, TJ. TJ and I have had our issues when I would house sit for my brother and sis in law but as of last night, all TJ has done was to outsmart me and talk back to me (loudly), but last night….he BIT ME! Yes, he did. He started squawking when Mom and I went in and would not stop. I spoke to the dogs, I spoke to Ms. Lola (sis in law's bird) and I went to speak to TJ. He was sitting on top of his cage and he walked around to the front like he was coming to see me. He jumped down on top of the opened cage door and acted like he wanted to come to me. I put my arm out so he could jump on and he leaned over and BITE ME! Freak'n bird! Thinking be might be good fried with gravy! LOL…he is a one person bird and he loves my brother. If you read the two post before this you will have already met my youngest brother Mark. This is him when he realized he had been gotten with the surprise of the party! The dark haired lady being hugged is my sis in law and Mark's wife, Kim. If you are a regular reader of my blog, you know that this is my sweet niece, Holly. She belongs to Mark and Kim. Now this woman is my other sis in law, Lori and her grandson, Coleman...I call him Cole. And Cole got around, this is him with his great grandmother, mine and Mark's mom. Cole was loving the cake for sure. Meet Chase's wife, Susan, and Coles mom. See, he went from one person to the other. Once again, Cole was in someone elses arms. This of course is my grandson Caleb holding Cole. They enjoyed each other so much. And here Cole was not at all happy. But with the cake....he was happier. This is the shot.....the shot where Mark realizes that he has been gotten! SURPRISE! My sis in law, Kim, Mark's wife planned a small get together with some of Mark's special friends and close family at Longhorn's Steak House for a SURPRISE B-day party. LOL.....this next shot is my youngest brother Mark AKA Markie being himself! I love it. Mark's birthday was actually on Friday but since he had to work that day Mom had the normal B-day dinner at her house the night before. Mark being comical said all bithday boys should have a b-day hat. So........he got a bowl out and wore it. So....I decided that Mark needed a hat for the party on Sat. This is what I came up with. And like I knew he would, he has no problems putting it on and wearing it for everyone to see. I love it. 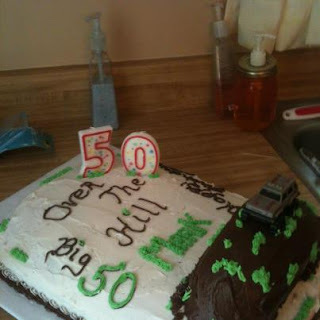 Yesterday my youngest brother turned 50! 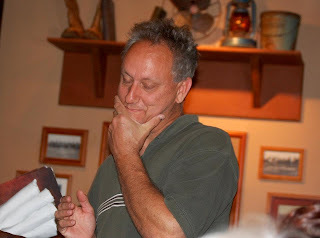 But tonight my sister in law sat up a surprise party for him at Longhorn's steak house. There were friends of Mark's and some family members. It was fun. So what do you think? I will share more tomorrow... not only did I make him a cake, I made him a Birthday hat! Months ago I told my two youngest grandboys that I would paint a mural on their bedroom wall. One of them loves tractors and the other one loves trains. 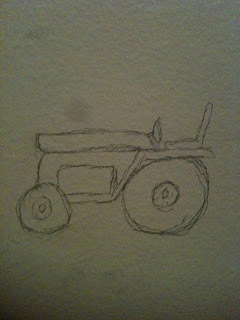 To start with.... A tractor. My helper always wants to help. He has been this way since he was a small child. Caleb painting on the barn. This is a pic of the train after I had it painted part of the way. And this is the train once I finished it. The barn once it was done. I have included the train and the tractor so both boys have what they like.